Seeking a very good alternative to Dropbox? Google Drive may just be the alternative you have been looking for. Developed by Google, Google Drive is Android’s stock online cloud. The service comes pre-installed on all Android devices. Google Drive is one of the most sought after Dropbox alternatives for all the right reasons. Where Dropbox offers 2GB of free cloud storage, Google Drive offers 15GB of free cloud storage. As soon as users register on the platform, there are offered with free 15GB o cloud storage, which may just be enough for a lot of people who are not heavy users. Please note that the 15GB of free cloud storage shared between Google services like Gmail and photos. Google Drive grants users access to various inbuilt Google’s productivity tools, such as Google Docs, Sheets, Slides, Calendar, Hangout and lots more. You will be able to upload and share documents. Pricing on Packages on Google Drive includes 100 GB for $1.99, 1 TB for $9.99, goes up to 30 TB for $299.99 (monthly prices). Sync is another top alternative to Dropbox. 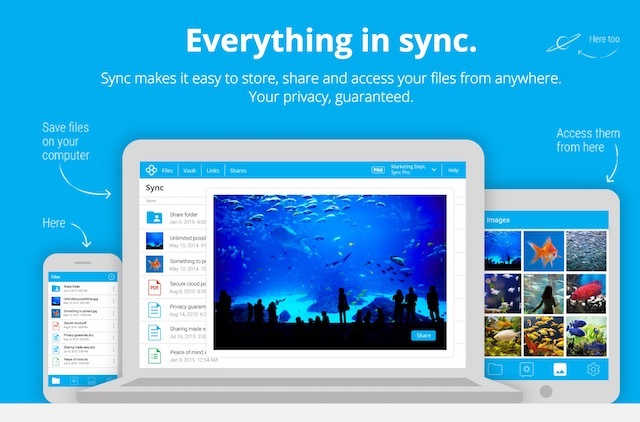 Similar to Google Drive, Sync offers cheap but awesome service. Cheap in price, but excellent in service. It is a secure and user-friend cloud service. Sync is available on the web, and also on all the major operating systems, we have today, which includes MacOS, Windows, iOS, and Android. Sync features Zero-Knowledge Authentication a feature that makes your files secure from many, include the eyes of hosts. It handles collaboration, It features a very intuitive and easy to understand interface. Sync lets you share the folder you want to collaborate on, allowing others access to it. It lets you set the level of permission member have to the stored folder. Sync offers 5GB of free cloud storage upon registration. Developed in Switzerland, P Cloud is one of the newbies in the cloud storage business, that is making waves. With only 3 and half years of being in existence, P cloud has gathered over 7 million users across the globe. One of the main selling features of the P-cloud is the fact that the desktop app PCloud drive doesn’t use the storage of your computer by default. P-cloud lets users move files from Dropbox to P-Cloud, which can be carried out using a free click. Unlike Dropbox that offers 2GB of free cloud storage, P-cloud offers 10GB of free cloud storage. Packages on the P-cloud service includes 500GB for #3.99 per month, 2TB for $7.99 per month, 2TB $350 one-off payment, Lifetime Plan and lots more. Still on the topic of best Dropbox alternatives, The Microsoft Onedrive Cloud service, is another awesome alternative of Dropbox. It houses a lot of features that make it a very excellent alternative to Dropbox. Similar to Dropbox and Google Drive, Microsoft One Drive features cross-platform app support, it syncs very fast, which is almost instantly. Similar to Google Drive, Microsoft Onedrive also offers users 15GB of free cloud storage. Microsoft Onedrive has flexible pricing, offering users a wide range of plans to choose from, the plan that best suits their needs. The Microsoft Onedrive cloud app features an inbuilt note-taking app, which comes in handy. Last but certainly not least, is Mega cloud service. Offering 50GB of free storage, Mega is the cloud storage with the biggest amount of free storage, featured on this list. The free version of Mega offers 50GB of free storage. Dropbox only offers 5GB of free storage, were as Mega offers 50GB of free storage, which is 10 times what Dropbox offers. Mega offers end to end encryption for data stored in its cloud. Mega also offers cross-platform app support, allow users to access stored data from any device, no matter the operating system. All that is required is an internet connection. Should You decide to go pro, Mega offers 200GB of cloud storage for €4.99, 500GB for €9.99, 2TB for €19.99, and 4TB for €29.99. There you have it – Best alternatives to Dropbox. Dropbox offers a very reliable and efficient cloud service, but if its pricing is a problem for you, the alternatives mentioned above should be taken into cognizance.